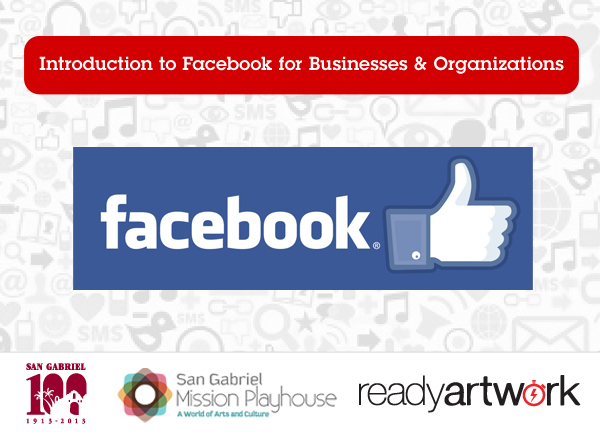 On Wednesday, March 26th at 7:00pm, Ready Artwork will be teaming up with the City of San Gabriel, and Mission Playhouse to bring you all another FREE Social Media workshop for local business owners and interested individuals. The last event covering Yelp and Instagram was a great success, drawing over 30 participants ranging from a car wash owner to a national light bulb importer. Our next event covers Facebook for businesses and organizations, and will feature more hands-on exercises to get participants to start understanding how to use Social Media to benefit their business.